Are you going to watch it Dave? If so I would love to hear if you think it is worth tracking down later or not. Sorry Sophie but no I won't be. Period dramas just aren't my scene, although the Beeb does have a good reputation with them. Mango Kiss I hadn't heard of. "The Children's Hour" I have already reviewed in this thread. If you've forgotten what it's like to be fifteen, it all comes crashing back in this wonderfully edgy look at the relationship between a sensitive, vulnerable young girl named Claude (Boys Don't Cry's Alison Foland) and her beautiful, quick-witted best friend Ellen (Freeway's Tara Subkoff). Filmed on the streets of New York City, this raw and realistic account follows an adolescent girl's struggle to find friendship and love in a world where kids don't count. Crossing the line between sexuality and friendship, innocent discovery and lifelong regret, she discovers what coming of age is really about. A very low-budget film. Overall I did enjoy it. Better than most other low-budget lesbian movies. Leisha Hailey (Alice from The L Word) appears as the second love interest. What happens when families come together for Thanksgiving? Almost anything! Sit back, relax and enjoy this "generous and charming" (The New York Times) tale of four very different families as they cook up some tasty holiday surprises: love, betrayal and even a few outrageous secrets! What's Cooking? reminds everyone of the astonishing power of love. As family get-together drama goes, it is a good movie. These type of movies just don't seem to be my taste. I bought this one years ago for my lesbian movie collection. I had started to watch this one then, but didn't get through it. Now I finally got around to watch it completely, after I learned that it was directed by Gurinder Chadha, who also did Bend It Like Beckham and Bride & Prejudice. This movie is about four families and their separate Thanksgiving family gatherings. These four family stories intertwine which works surprisingly good. Tom, another one you should put on your radar for this marathon is Chloe. I watched it today and phew. I don't want to give away anything but it was totally unexpected. I'm still undecided on whether I liked it or not, I'm still trying to wrap my head around what I actually watched. But it should certainly be on the list for this marathon. Thanks for the tip! I will keep a look out for it. Revealing a surprising side to the world painted by Jane Austen and the Brontës, this moving drama tells of the passionate and dramatic life of Anne Lister, Britain's first modern lesbian. "I was not born to live alone. I must have someone with me and in loving and being loved, I could be happy"
A landowning gentlewoman who defied convention, Anne Lister follows her passion in pursuing and seducing the beautiful Mariana. However just as their exhilarating, illicit affair threatens to scandalise society, Mariana chooses to marry the older but wealthy Charles Lawton. A distraught Anne, denied the love of her soul mate, is forced to look elsewhere for the passion she craves. 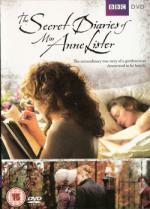 In her remarkable struggle to survive Anne discovers new depths that test her spirit and the fortitude of her convictions. An okay movie. But I didn't enjoy it as much as Fingersmith, which is set around the same time I believe. Nothing really surprising. It is about as much as I expected from the trailer. A nice romance which is fun to watch. It's a French movie shot in Mandarin. Originally I thought this would be set in the past (19th century or so). I was pleasantly surprised that it is set in the relative present (I read that it is supposed to be set in the 80s or 90s). I enjoyed it, but the ending is stupid, though not unexpected. The girls are executed because their homosexuality supposedly was the cause of the heart attack of the father of one of the girls. Hey Tom, have you heard about the new film The Kids Are All Right with Julianne Moore and Annette Bening? That link is to the Empire review, but I also saw a clip tonight on Film 2010 and it looks really good. Apparently the cast are superb. Moore and Bening play lesbian partners who have two teenage kids, conceived via sperm donor. The girl is now 18 and she finds out who her biological father is (Mark Ruffalo), looks him up and brings him into the family. His mere presence causes upheaval. It's pitched as a comedy drama and seems really solid. which is a type of stereotype they wish to get rid of. No, I haven't heard about this movie, I think. I will take a look out for it. Thanks! Is it being judged on what has been heard about the plot or what has actually been seen? It all depends on the context of the story and they were saying how brilliant the characters are so it could turn out to be very intelligent and the exact opposite of what's expected. I haven't seen it, of course, but they did say it is in some ways about a marriage, about taking each other for granted, so perhaps the guy represents her as acting very out of character, as a sub-concious way for her to break the monotony. It's a story used in the opposite way a lot, where one partner in a heterosexual relationship has a gay affair because in a perverse way, they might think they aren't cheating because it's impossible for them to actually love the other woman/man. By turning it around and making the homosexual pairing the more loving and the one with a future, it should turn out to be an important film for lesbians. I wouldn't be surprised if it has a confident, life-affirming ending that redeems the plot. I haven't seen it myself. I'm just going by what I read on the website http://www.afterellen.com/ On that site some bloggers liked the film, but many others hated it. So it really is drawn down the middle within the actual lesbian community. Personally I want to see it just because Mia Wasikowska is in it and I quite like her so I will reserve my judgement.